I have been utilizing this idea for the past six years and it ALWAYS seems to be the first thing kids bring up when they come back to visit me. I usually pull off this little stunt in conjunction with Columbus Day, but my European vacation was already in full swing during that last day before October Break (thanks to my awesome teaching partner). Well, we didn't want to miss out on the opportunity, so my co-teacher and I decided to rock the boat building extravaganza the day before Thanksgiving Break this year. Yup, you read that right . 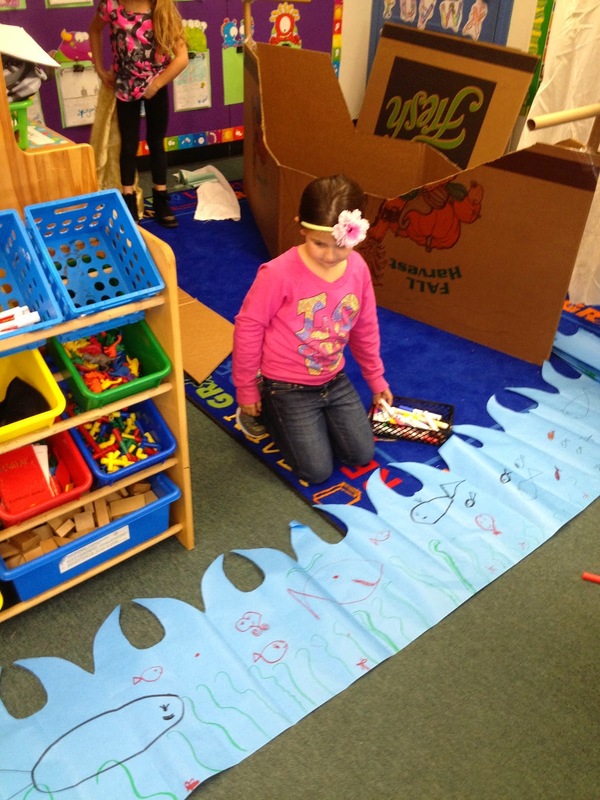 . . boat building. 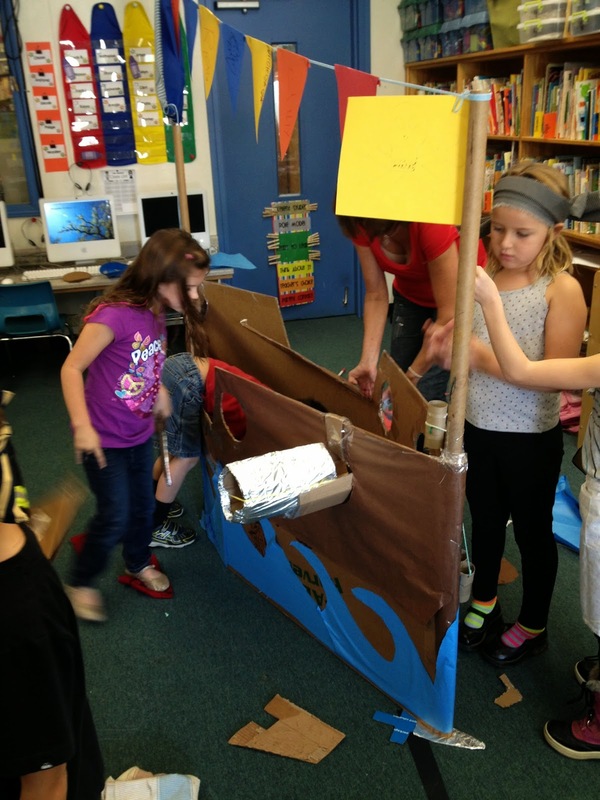 What better way to take your social studies to the next level and foster team building than a ship creation day? 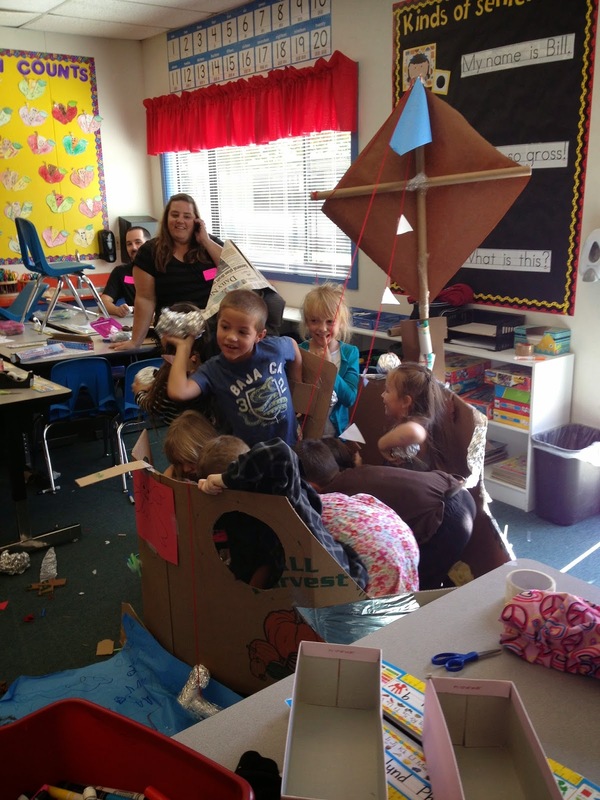 The parents get involved too and the classroom quickly turns into a sweet little community . . . it's truly a magical event. As I stated before, we usually make the Nina, Pinta, and Santa Maria the day before October Break. 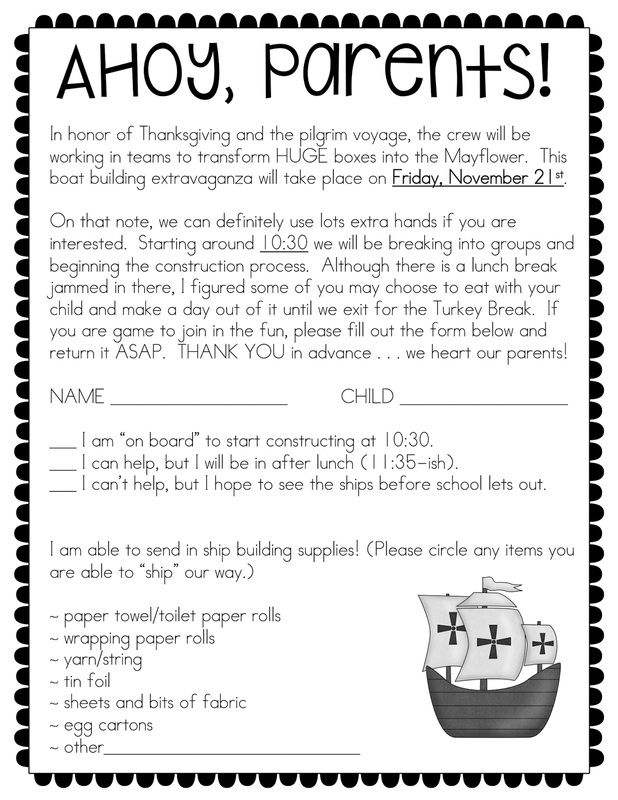 Well, this year we will be constructing our version of the Mayflower the day before Thanksgiving Break. We all know that this day is pretty much a wash. So, why not get the most out of the final hours by blowing it up and going ALL OUT in the hands on learning department? I know it is still October and I am already yammering on about Thanksgiving, but I am giving you plenty of time to get your ducks in order if you choose to run with this activity. We pretty much have 14-16 days before we are out for Turkey Time. Um, excuse me, Time??? Could you please slow down a bit? Here's how this typically goes down in my room . . . a schedule outline of sorts. 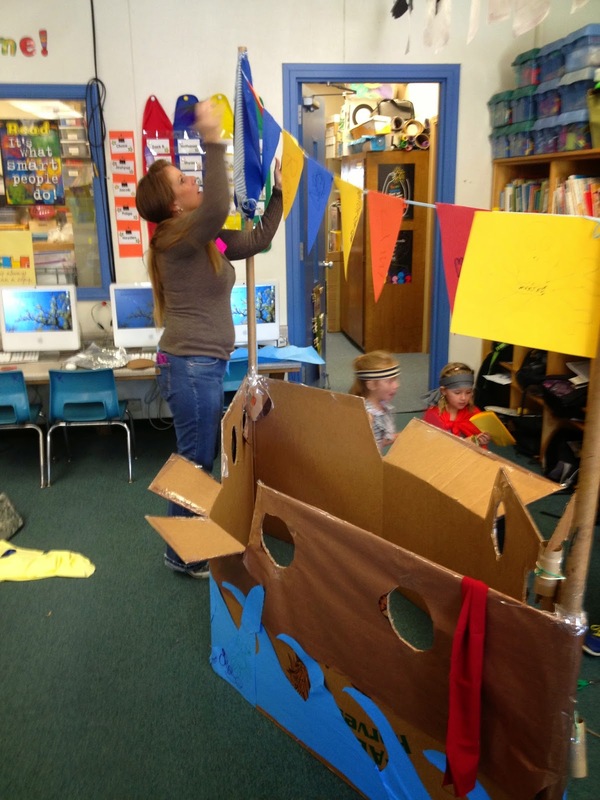 During the week before Thanksgiving Break, the kids will learn all about maps, directions, and the pilgrim's voyage. We also study the parts of a ship. Then, on that final Friday, our BIG buddies will come in and help us make pilgrim garb. After the exit and we have a quick recess, the brave parents to come in and help us turn huge produce and/or appliance boxes into the Mayflower. The transformation is always so cool to watch. It is controlled chaos at it's best and the classroom gets totally thrashed. The parents will jump in with the BIG details and the kiddos will assist. The teamwork that transpires will truly melt your heart. Does this sound like something you may want to roll with? 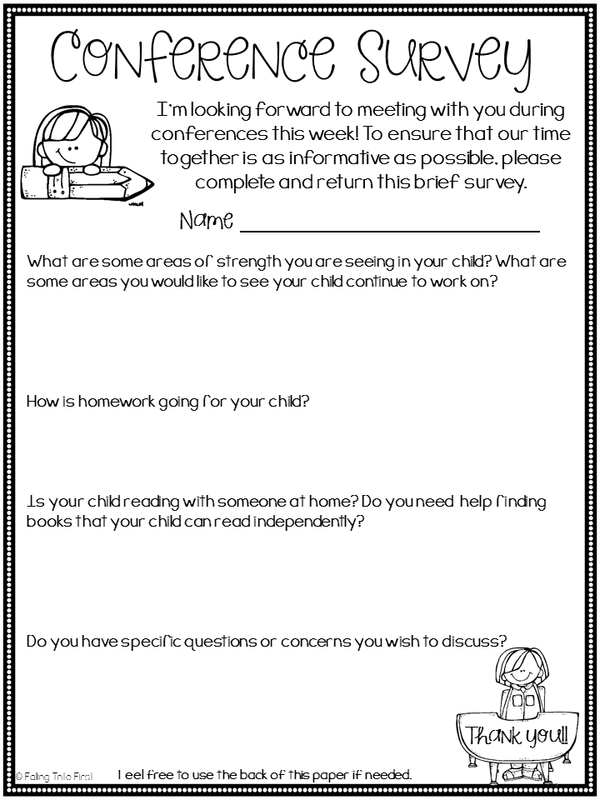 You can snag a copy of my Parent Note (as well as an editable version) down below. Just click the picture to snag the Power Point. One final thing for you before I jet. If you are thinking of rolling with this, work on getting the BIG boxes now. Contact your local appliance store or grocery store (the pumpkin boxes work perfectly and they are easy to snag this week). Stores are always really helpful, but they don't always have them on hand. They may have to wait until they get a shipment or one becomes empty . . . so, ask early!!! Alright. There's my nutty idea for you. I won't lie. It is a bit of extra work up front and my blood pressure goes up throughout the process, but this activity always turns out to be my FAVORITE days of the year!! However, that isn't the best part . . . it's the kiddos' grins that make it so worth while. Oh . . . one more random tidbit. In honor of my birthday, I am throwing a sale today and tomorrow. Snag any of my items for 20% off!!! Hey! Holly here, from Mrs. Ehle's Kindergarten Connections! 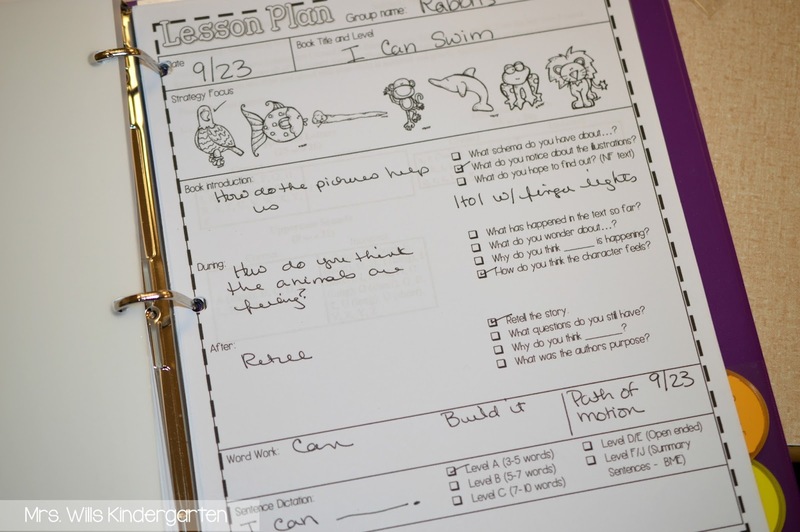 Have you secretly dreamed of having your own "Doc Cam" in your classroom? Let me guess...you've seen the multi-hundred dollar price tags of some of the big name brands. Not possible on your school or personal budget? Well...no worries! I have the answer for you!!! This little guy is the answer to all of your doc cam needs! This little guy does it all! It's one of the best kept "techie" secrets out there! Are you excited or what?!! The possibilities for making your content come alive are now limitless! How about recording a video snippet everyday of those tadpoles in your science center...then combining the snippets to create a mini-movie of the life cycle of a frog?! 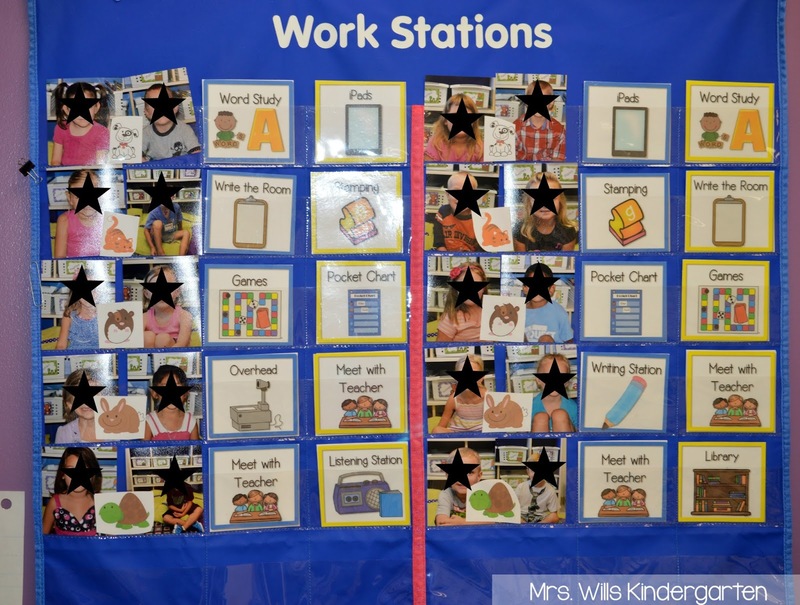 Or using "HUE" to record student reading behaviors and creating developmental portfolios for your kiddos? 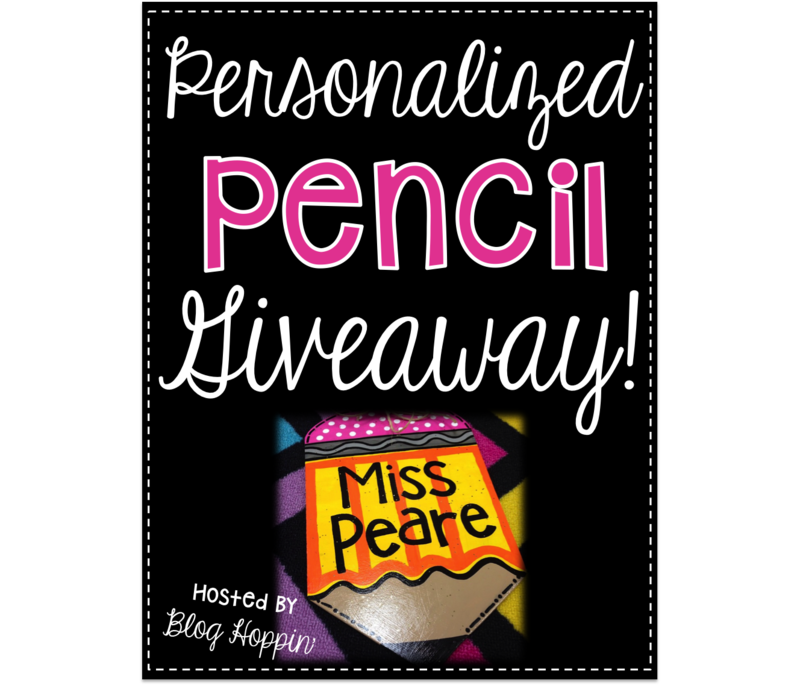 How about using "Skype" to communicate with "pen pal" classes around your district, state, or world?! Or... simply use this little man to project a regular book up on your interactive whiteboard screen for the whole class to view! 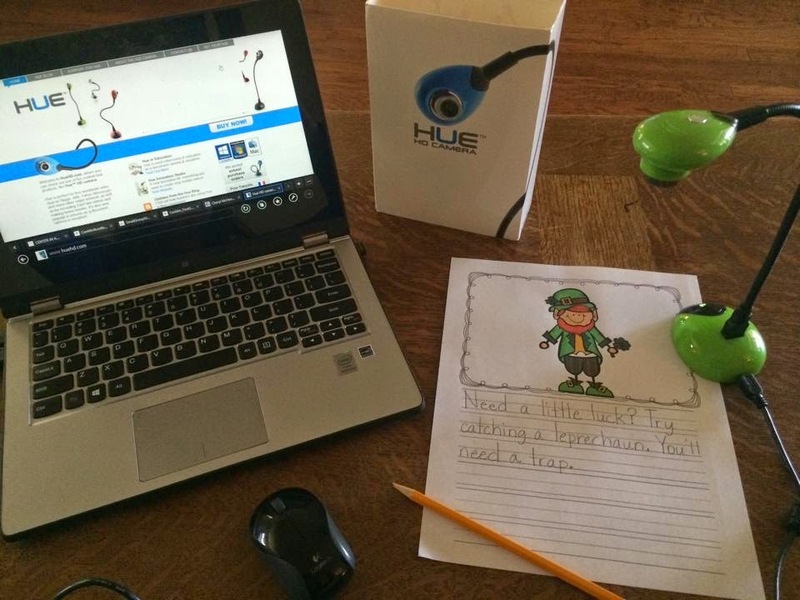 The HUE USB camera is a cost-effective alternative to a standard classroom document camera/visualizer. Easy to use and portable, this camera is popular with teachers and students throughout the world. The camera is 'plug and play' on Windows PCs and Macs and compatible with most video conferencing, streaming and web-casting software i.e., Skype, Yahoo! Messenger, Google Talk, iChat, FaceTime, uStream etc. 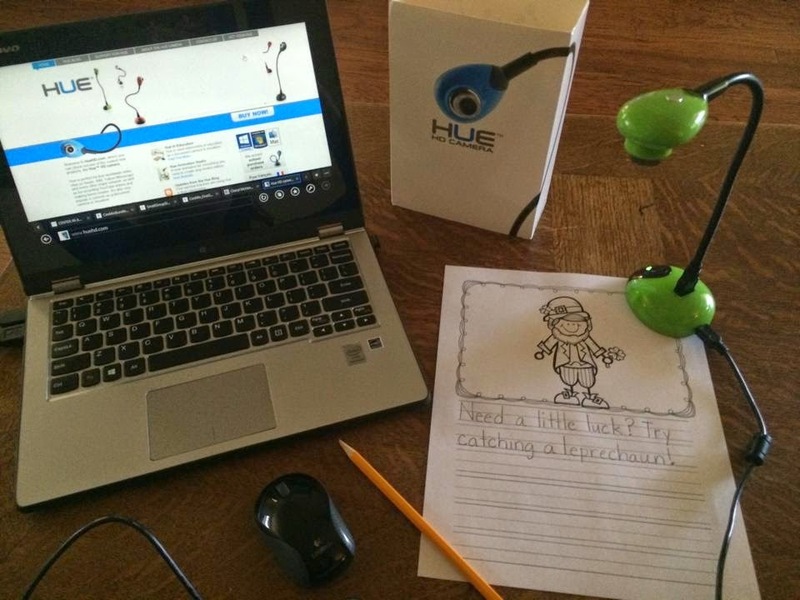 By connecting your HUE camera to your computer and a projector, you can share students' work, books, experiments and pictures. The built-in microphone allows you to record your presentation or a student speaking about a topic. 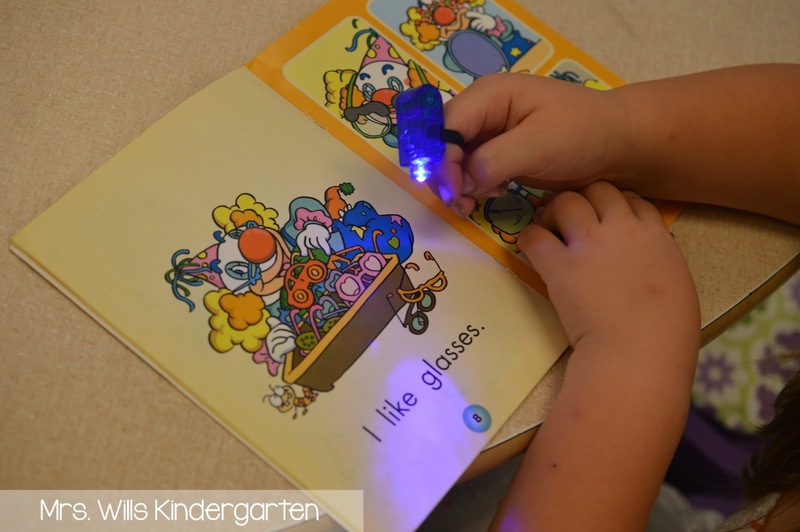 With its weighted base and flexible neck, HUE can also be used to magnify very small items such as insects, circuit boards and more to share them with the whole classroom. 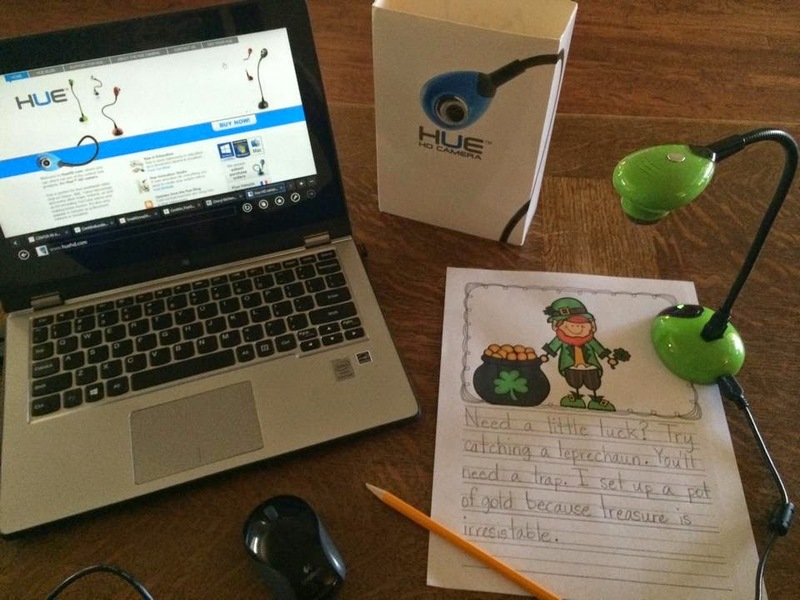 Click HERE to learn more about HUE! HUE is getting a lot of attention…it’s been on Good Morning America and is featured in the Tech Buyer’s Guide in Time Magazine’s Best Inventions. Hue Animation Studio also recently placed first in the Best Arts and Craft category at the Dad's Choice Awards. 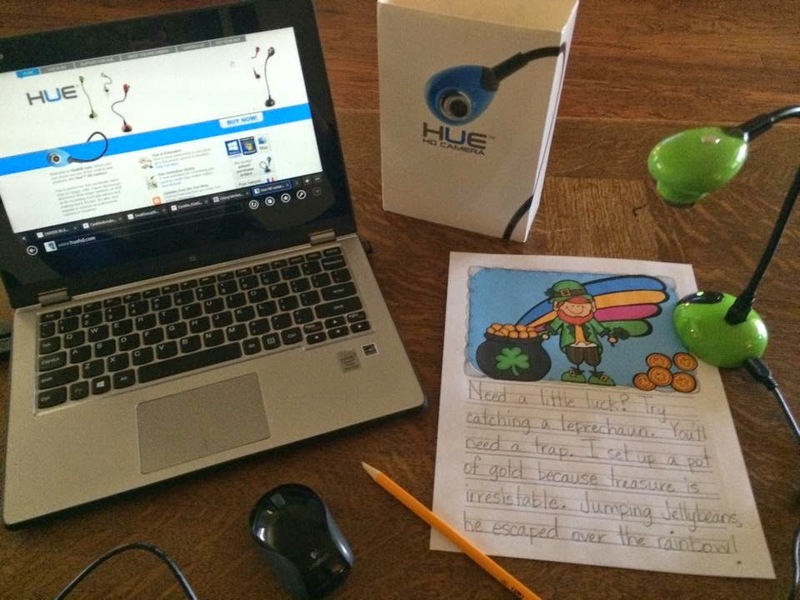 Many of our very own BLOG HOPPIN' authors are using them in their classrooms right now! 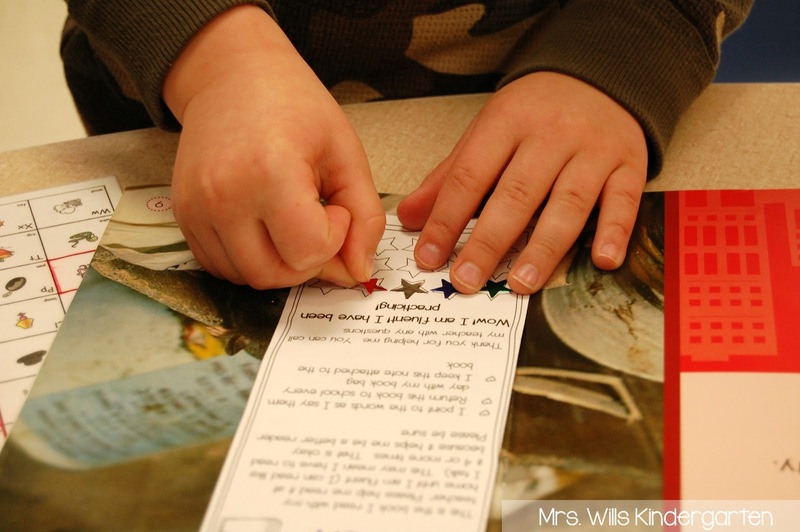 Cheryl, from Primary Graffiti, shared these pics and this idea of making a mini movie and turning it into a mini-lesson. 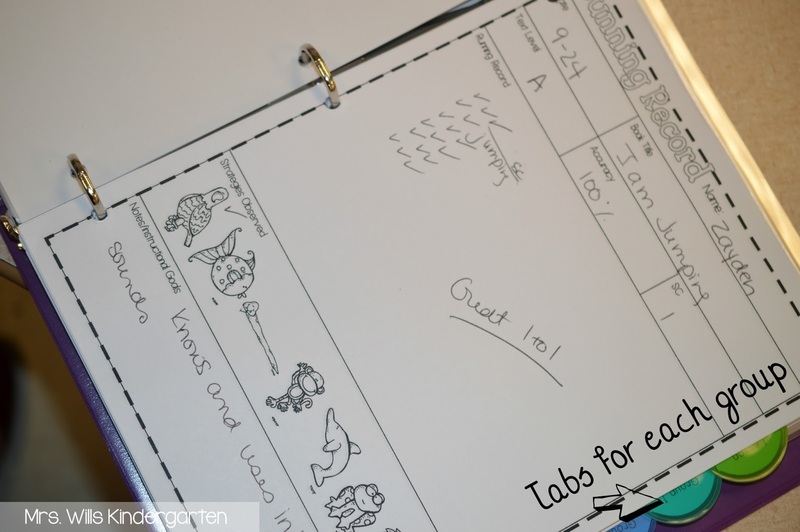 Cheryl is working on creating a visual rubric, and the pictures here show how she is using HUE to show the progression! Great idea! So…How about you? Do ya’ want one? Well…We are giving one away! Simply enter our Rafflecopter give-away below for your chance to win! For more information about HUE's animation software, click on the picture below! Looking forward to hearing about all of the great techie projects y'all will come up with using the HUE! Hey, Blog Hoppers! It's Megan, from Kindergals. I am always working on establishing healthy friendships in my classroom. I am sure if you are anything like me, we all have our years where we feel like our students will NEVER get along. Then, there are years where our students just blend and work really well together! Last year, I had a group that really needed some positive motivation to get along. I created these "good friend" badges to help highlight students who were being good friends! At the end of the academic segment, I would highlight that student and explain to the other boys and girls what the student did to earn the award. They got to wear the badge all day! At the end of the day, I would take off the badge and put the sticker on them. This made sure their parents knew that we were supporting positive friendships in our classroom. I hope this helps you establish good friendships in your classroom! Hello Blog Hoppers! It's Natalie from What the Teacher Wants and today I'm going to share with you a little secret… I love essential oils! I've been using essential oils for almost 3 years. Let me first tell you how I got started. A friend introduced me to essential oils shortly after my second child was born. I had been experiencing a little postpartum anxiety and my good friend mentioned that there was an oil (Balance) that acted as a natural way to help with anxiety and, guess what, it worked! After that, I wanted to see what else the essential oils could do, so I ordered a few more, then a few more, and now I have almost every essential oil that doTERRA makes. 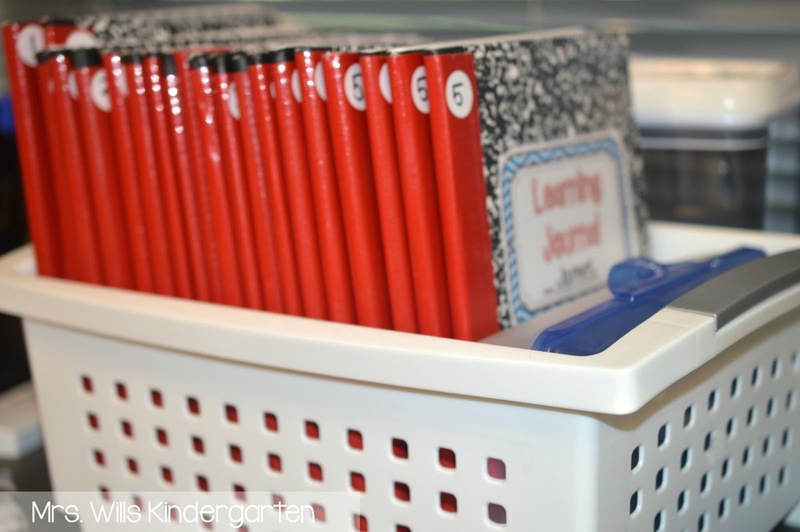 I use them at home and in my classroom and have really loved finding more natural ways to help my family and my students. Recently I've been getting lots of questions from friends about essential oils so I thought I'd write a little post about using them in your classroom. In this picture, you'll see the Aroma Lite Diffuser and three essential oils that come in an Introductory Kit. They are three popular essential oils (lemon, lavender and peppermint) that can be used for many different things and are great for classroom use. 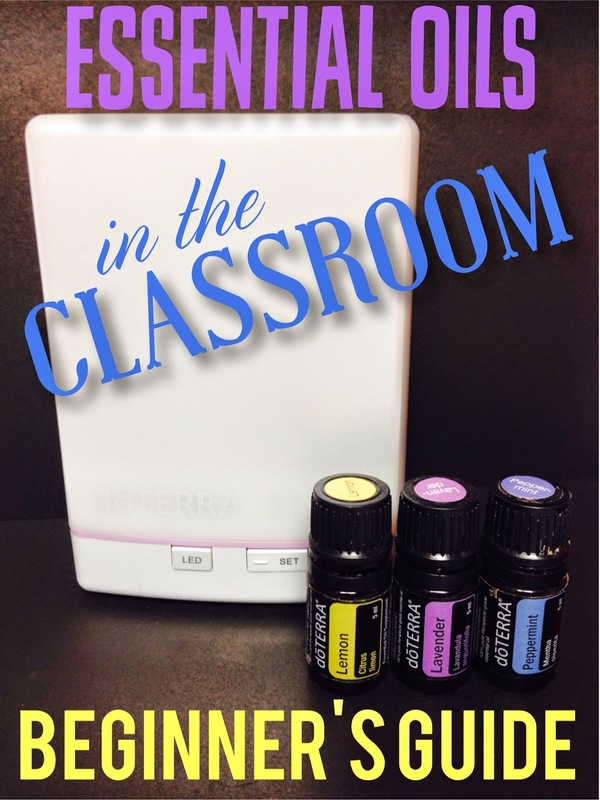 Diffusing oils in the classroom is a great way to use essential oils. It breaks the essential oils down into smaller particles and works as aromatherapy when your students breathe the air. In a nutshell, lemon can help energize the students in the classroom and also helps clean and freshen the air. 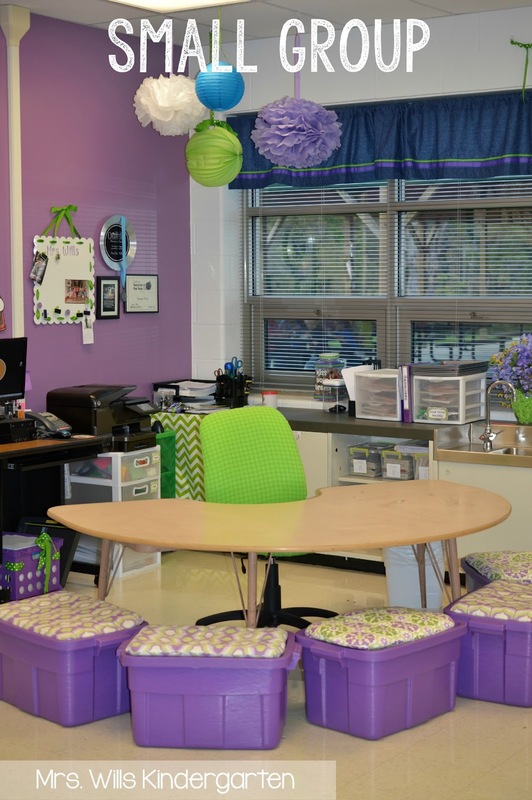 Lavender helps with calming and can help students feel more relaxed. Peppermint helps to relieve stress and can help students be more focused. I also recommend the line of On Guard products. In this picture you see the On Guard Foaming Hand Soap, pump, and essential oil. 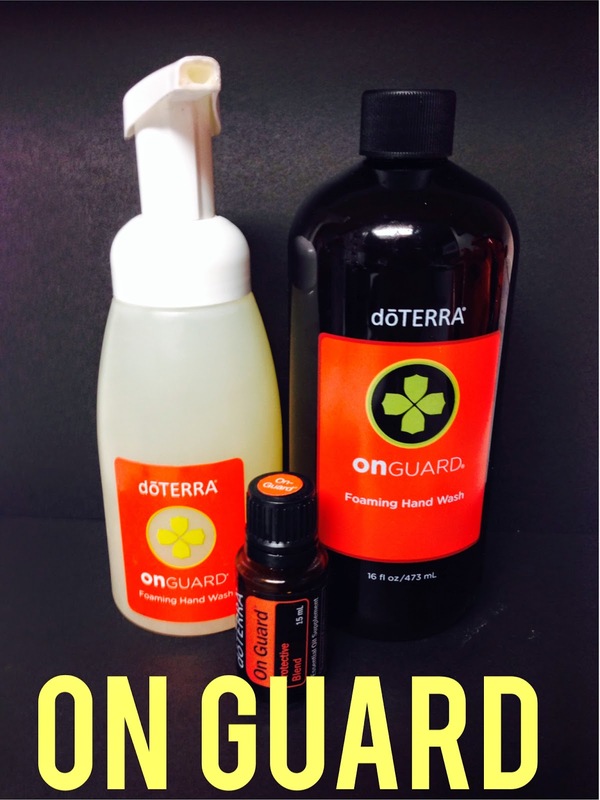 On guard is a fabulous oil in the classroom because it helps support the immune system, can help clean the air, and kills airborne pathogens. Diffusing this oil during cold and flu season can help you and your students stay healthy! I also love using the foaming hand soap in my classroom. I feel that it does a much better job of cleaning gross germs than regular soap. Getting started with essential oils can be overwhelming. There are lots of different oils that can help with all sorts of things. They can also be pretty expensive. Find one or two oils you'd like to try and then go from there. I like to use Pinterest as a way to find good ways to use essential oils. Click here to find more websites on how to use essential oils in the classroom. To learn more about essential oils, you can watch this video. Besides teaching and blogging, I am also a doTERRA Wellness Advocate. You can visit my webpage to look around, or if you have any further questions about essential oils, please feel free to leave a comment and I will try to respond to all your questions. Thanks for reading and have a very happy weekend! Hi Friends! It's Stacy from Mrs. Johnson's First Grade wanting to quickly share some fun ideas we have done to celebrate Fall and Halloween so far this month. This was actually something I had done a few years ago and wanted to bring it back again this year because it was so much fun! I try to keep Halloween about fun rather than "scary" for my First Graders because I do have a few every year who don't celebrate it. We had been learning about nocturnal animals so I ordered Owl Pellets from pellot.com again to learn more about owls. It comes with posters and skeleton maps! The students got to match the bones they found to the bone map to find out what their owls ate. We also used Pumpkin seeds to practice counting by 2's, 5's, and 10's. This activity also introduced them to Place Value as they worked to find out how many seeds were in their pumpkin. This was a 2 day activity. Day 1: We emptied out the pumpkins and washed the seeds. Next, I read them the story "How Many Seeds in a Pumpkin?" by Margaret McNamara and Brian Karas. This got them thinking how they might count the seeds. I took the seeds home and baked them so they were ready for them to count the next day. Day 2: The class decided that counting by 10's would be the easiest and fastest way to count them. I gave them little cups to hold their groups of 10 and larger cups to hold groups of 100. It's pretty simple and easy to do. Plus it gets the students working together and having fun! We still have more we want to do with pumpkins next week....Life Cycle of Pumpkins! Sorry I don't have that to share yet! Check back on my blog soon! I revamped a few of my focus wall posters and thought I'd share them with you all. Sloppy printing makes me CUH-RAZY! We work on it a lot in class. A lot! My kiddos no my expectation and work hard to write neatly most of the time. 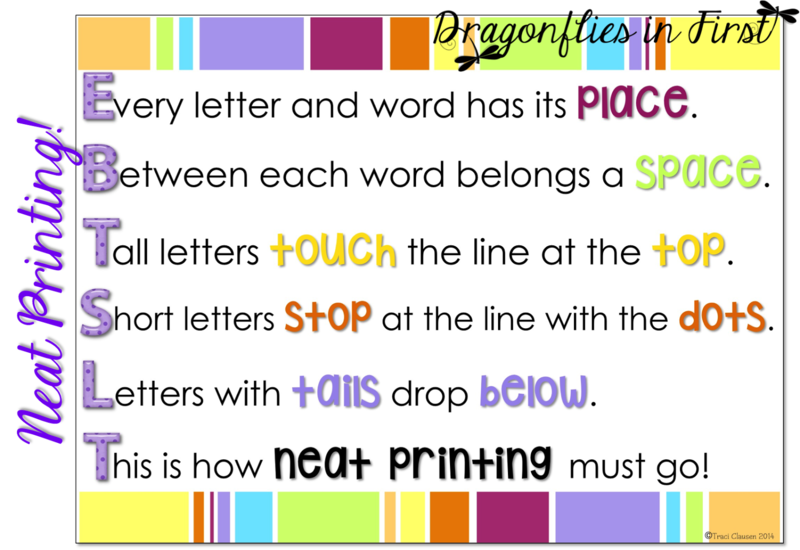 I created this poem to help my kiddos remember the basic rules of printing. We recite this little ditty every day during the first few weeks of school. Then, refer to it often as the year progresses. "Are your letters with tails dropping below?" "Hey, doesn't g have a tail?" "Whoah! Look at how perfectly Cammie's letters stop at the lines with the dots!" 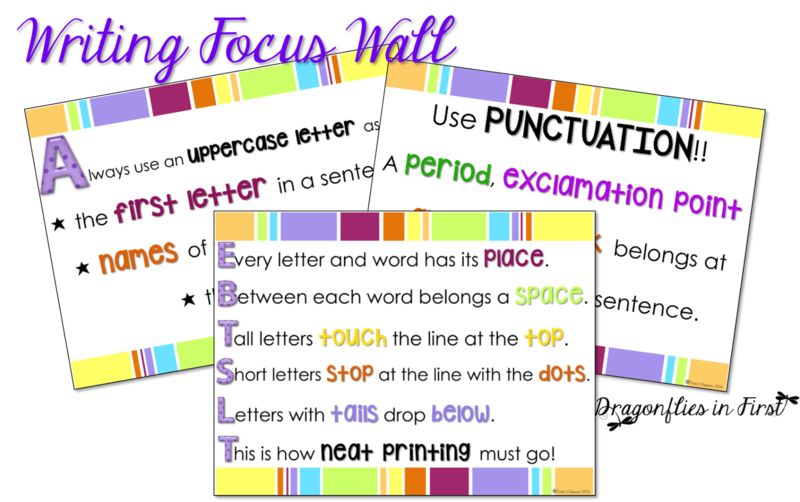 Having the visual reminder on the focus wall for the kids to refer to is helpful, too! This little poem sits on the board beside these little reminders. After laminating my focus wall posters, I put self-sticking magnets on the back of them so I can move them around as needed. My focus wall is on the side wall in my classroom, but I will move a poster to our main white board when we're focusing on a skill. 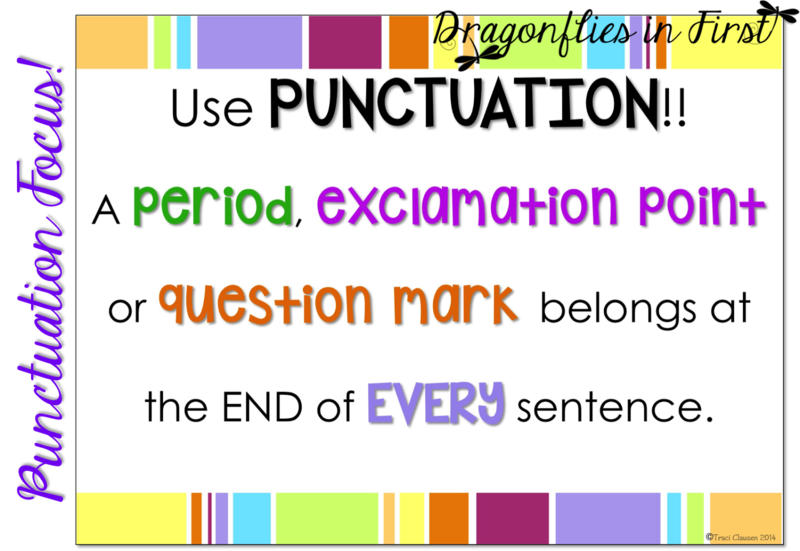 This also makes these reminders part of the learning, and not simply decoration. If you'd like a FREE copy of these posters for yourself, click the pic below to visit my Facebook page. The focus wall posters are FAN FREEBIES. Just click the fan freebies tab (viewable on a computer) on my FB page. Hay Y'all! It's Rachel from the tattooed teacher! I wanted to share a little about how I begin each November. Day of the Dead...it sounds so... scary? macabre? But the more I learn about it, the more I appreciate how special the holiday is! I first learned about DOD from a teammate who did projects with her kiddos. She gave me the rundown and we made pretty skulls with lots lots of glitter, skeleton puppets, and dead authors projects. I must say it intrigued me. But I didn't teach anything about the reason for the holiday. then I moved down to 2nd grade. would it be too scary for them? Why, that's silly! It's a HOLIDAY for Heaven's sake! I spend a day reading, talking, sharing, and creating about DOD. We read about all the why's and what's first thing in our minibooks. And this year with The Book of Life movie, I think the kids will really connect! 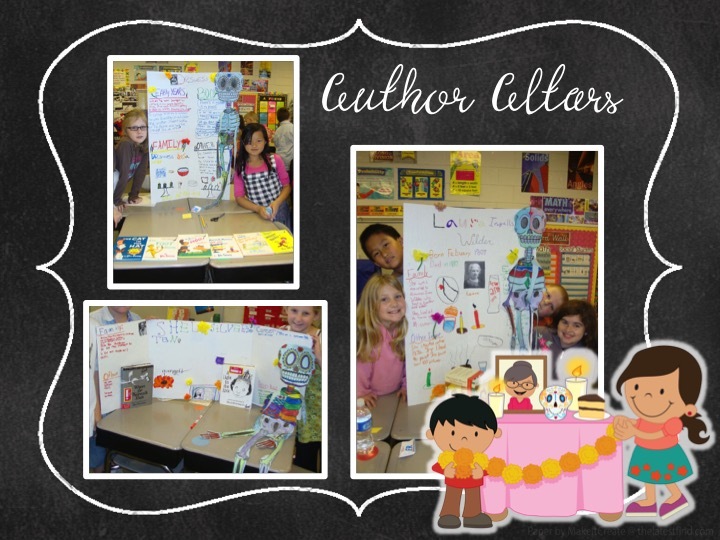 We used trifolds to display info of a favorite author who has died. I did this with my 4th graders! We attached paper marigolds and added altar details like candles. They did all their research in the lab using the note taking booklet I made. Oh the skulls! Aren't they beautiful!? This is still my favorite activity! We also buy Pan de los Muertos (bread of the dead) from a local shop and enjoy it while we watch a slideshow our ESL teacher does with us. She is from Columbia and they love hearing her first-hand knowledge. 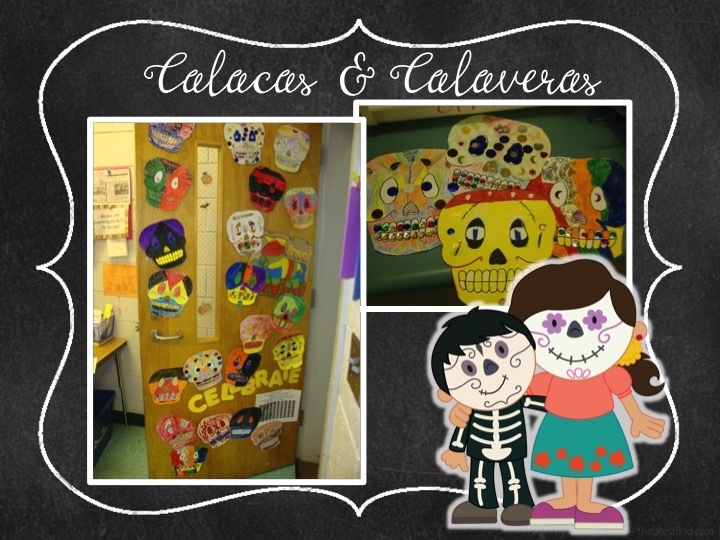 If you're interested in learning about Day of the Dead, check out my unit! There's tons more to choose from! and here's a little freebie! 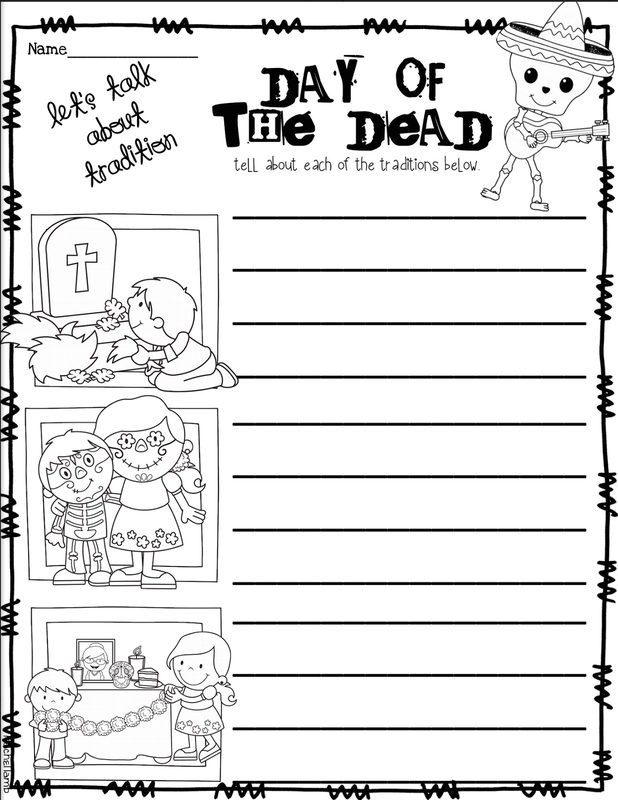 We focus on the traditions and important figures when we study holidays, so I just added this little traditions writing page! You can watch a video (or use my unit) and have the kids tell what they learned about each of these traditions! 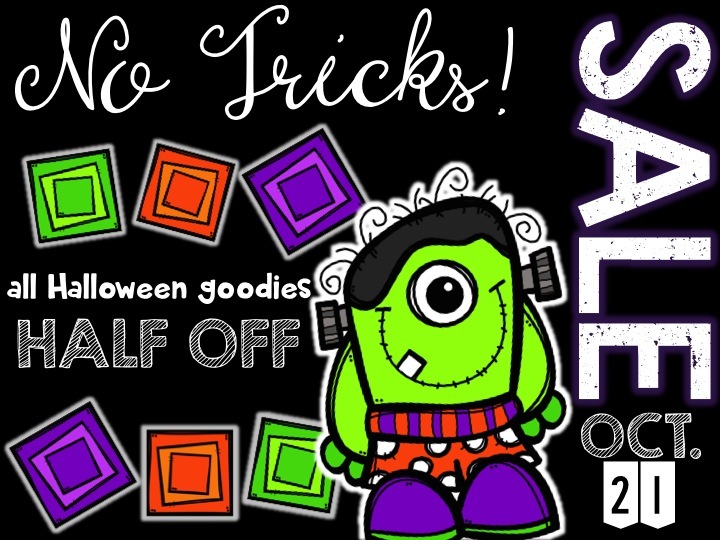 PLUS-Here's a little bit of Halloween goodness for you! 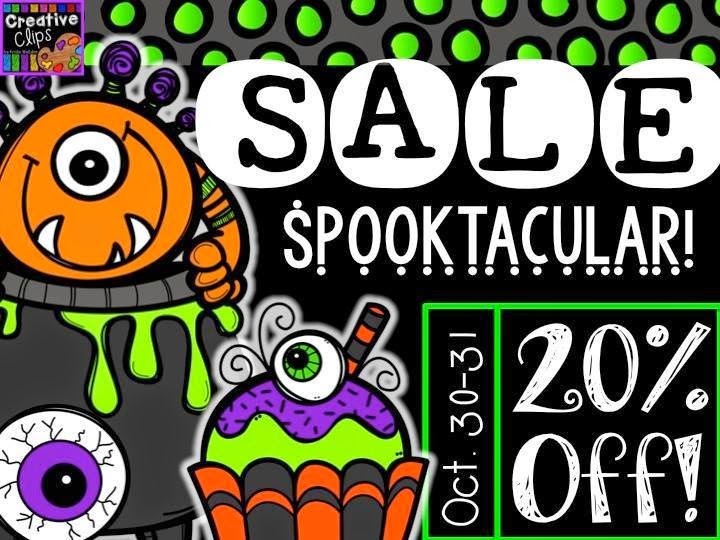 ALL my Halloween/October products are HALF off today only!...10 more days til Halloween! Are you ready?!?! Hey guys! It's Stephanie from Falling Into First stopping by tonight to talk about Parent Teacher Conference prep. It's that time of year again over in my neck of the woods. Is anyone else scurrying to prep for conferences? 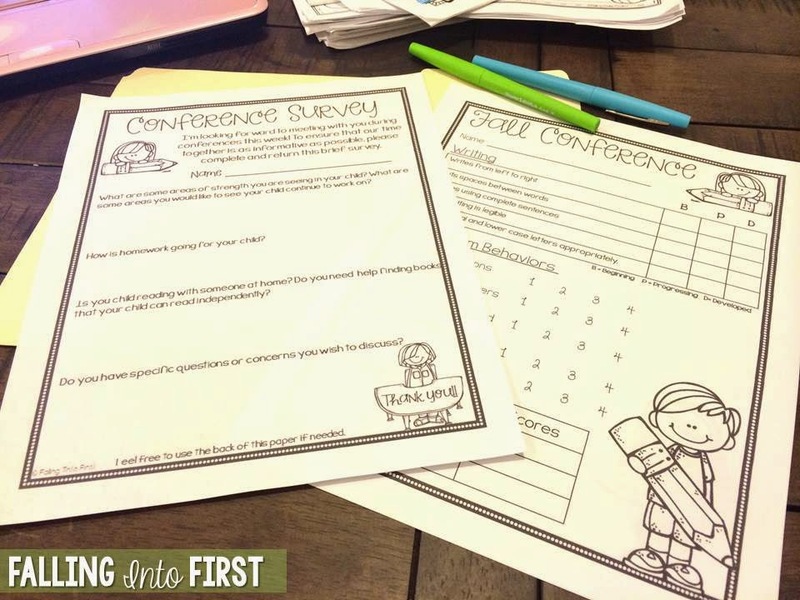 As part of my conference prep, I send home a short parent survey a few days before conferences to help give me a better idea of how to structure my conversation with each family. We only get 15-20 minutes TOPS to talk and the time goes by FAST! I want to know what they're seeing at home: areas of growth, areas they want to see growth, if they're child is reading, and how homework is going. Also, I want to know if there is anything they have questions about or would like to discuss in detail. This ensures I can properly address it during the conference. It also helps give you a heads up about what's on their mind. Nothing is worse than having to field a question you weren't anticipating on the spot! 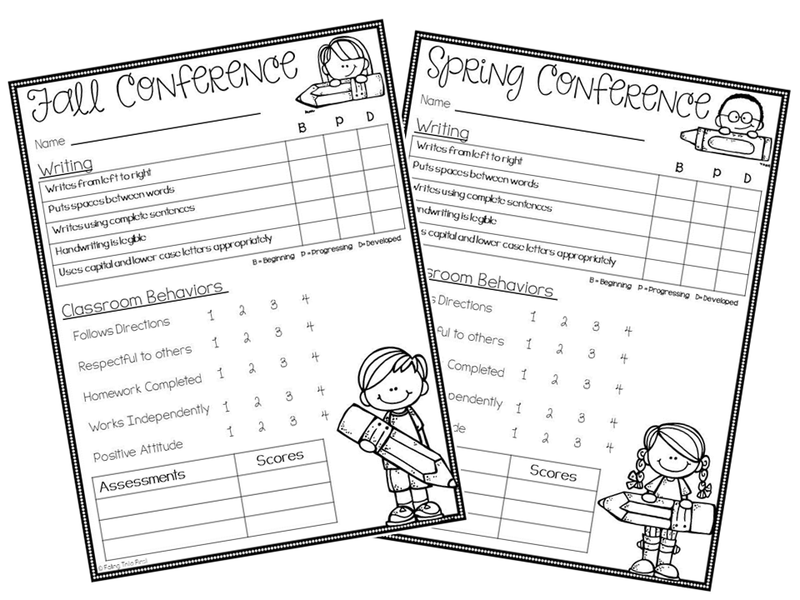 This next sheet is a quick glance at writing, behavior, and assessment scores. 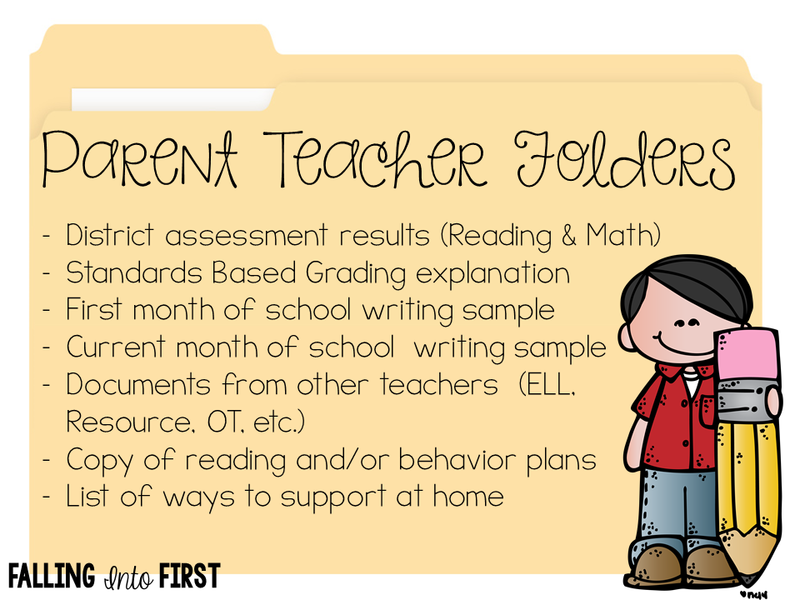 It will go inside the manila folders that I put together for each child. The manila folders make it super easy to grab and be ready with everything I need when a family walks in. They will also get to take this folder home with them. There is nothing cute or fancy about these folders. Just plain folders with the child's name written on them. Here is a list of all the items that might go into a child's conference folder. I put the two conferences sheets I showed you above into a little freebie. Click the cover below to download these forms. Alright kids, I'm off to keep prepping for my conferences. Burning some midnight oil over here. I'd love for you to stop by and visit me on my Blog, Facebook, or Instagram! 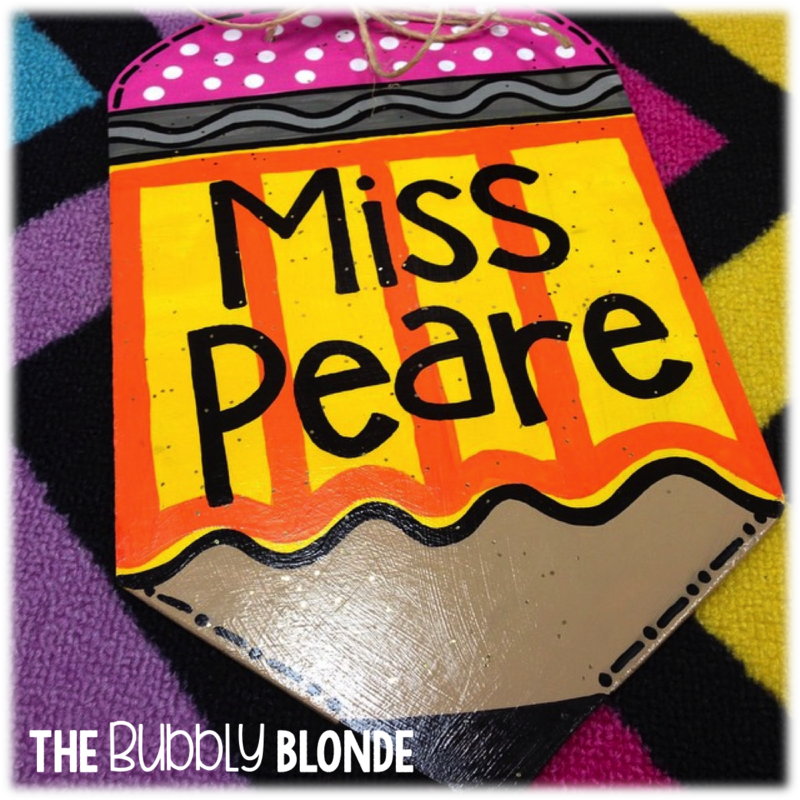 I few weeks ago I blogged over on my blog about my small group. In case you missed it, here it is again. This is where the small group HAPPENS! First I assigned my groups. I name my groups to just keep it easy. I let my most fragile learners pick their group name first! I updated all of my station work board cards this year. You can get them for FREE here! I formed my groups based on the data reports I was able to get from ESGI... Um... love that program! 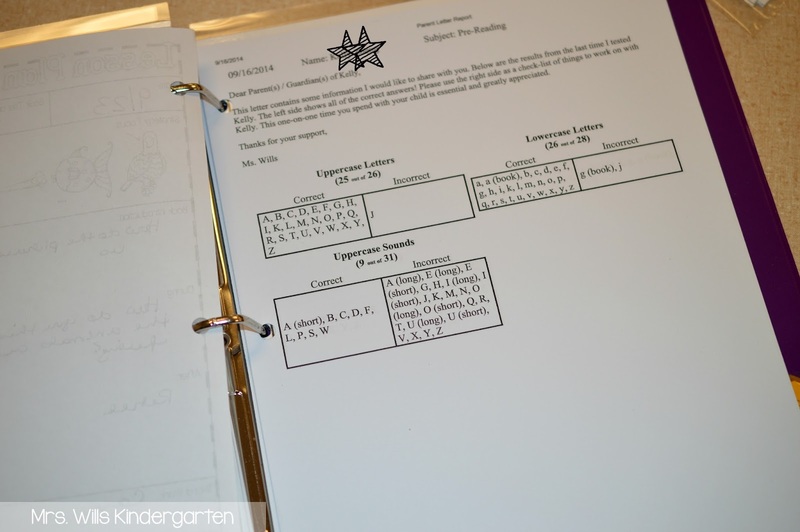 I organized my binder and added each student's report under their group name. This will help me to form goals for the groups when I plan. Clip art by the adorable Mel at Graphics From the Pond. Click on this picture to download your FREE cover. 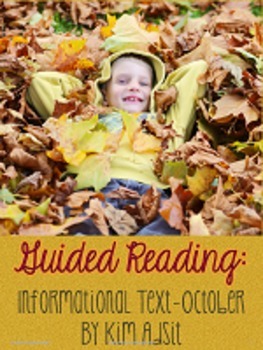 From Deanna Jump's Guided Reading 101 unit. Don't judge about my messy handwriting... it is, what it is. I was able to take a few running records this week. 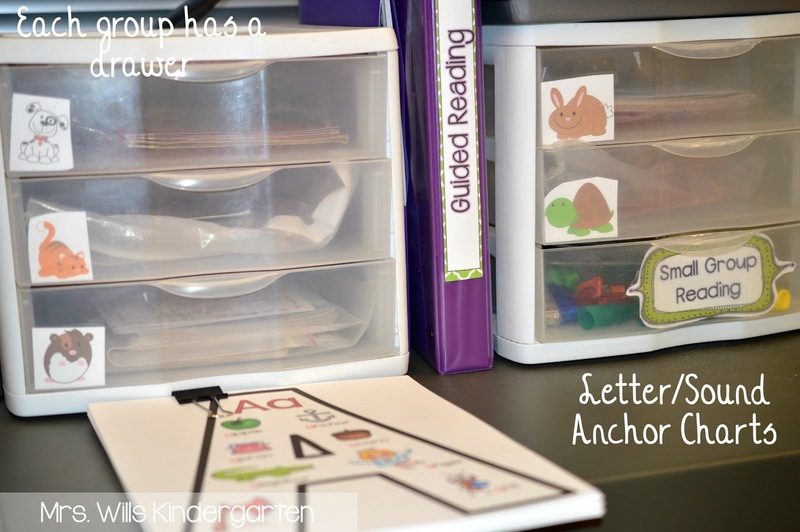 Anchor cards can be found in Cara Carroll's ABC unit! I love it! We are adding this bookmark to our reading bag next week. This bookmark is how I reinforce nightly reading. 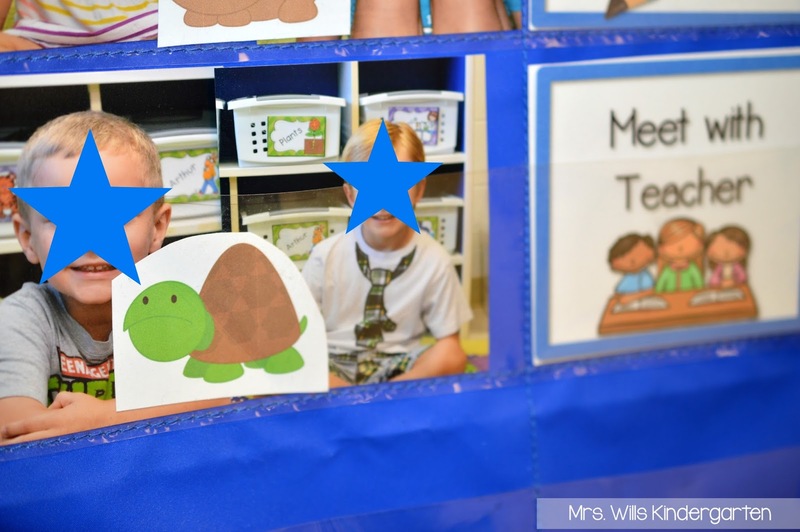 Students earn stars when they demonstrate fluency. 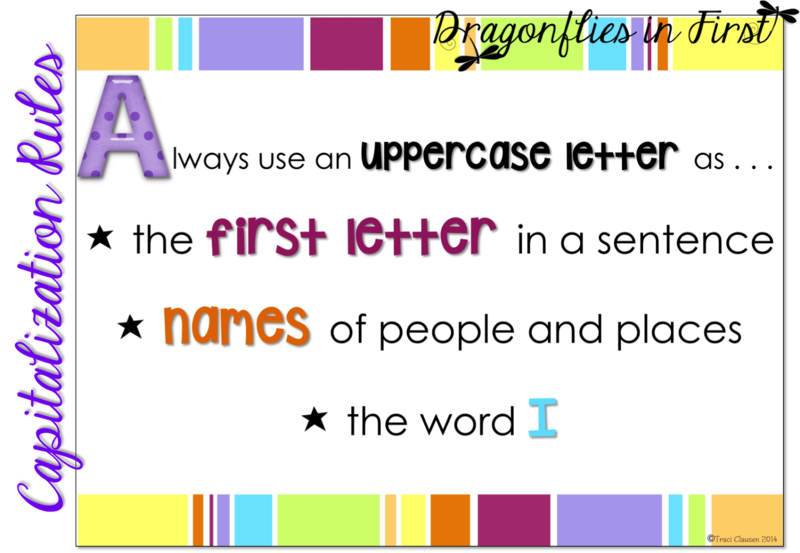 You can download the bookmark for FREE on my Facebook Fan Page. 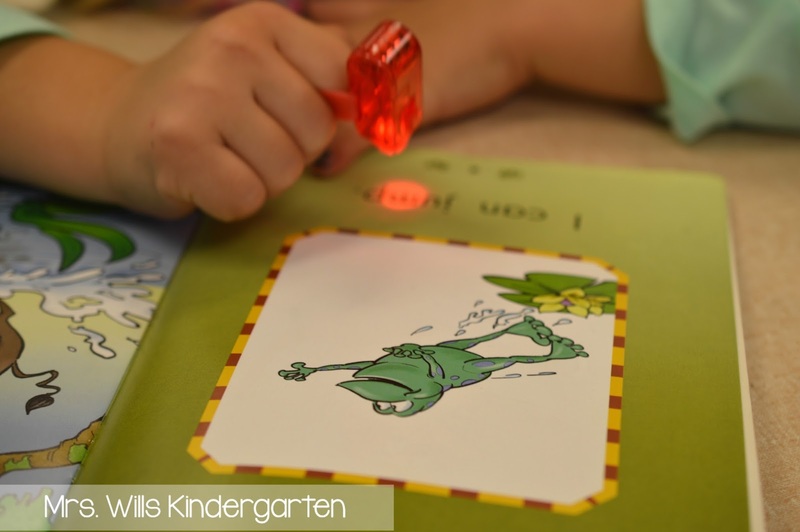 We got our laser finger pointers going to help encourage 1-to-1 correspondence. It was sort of a big deal. (You can find these at the dollar store). 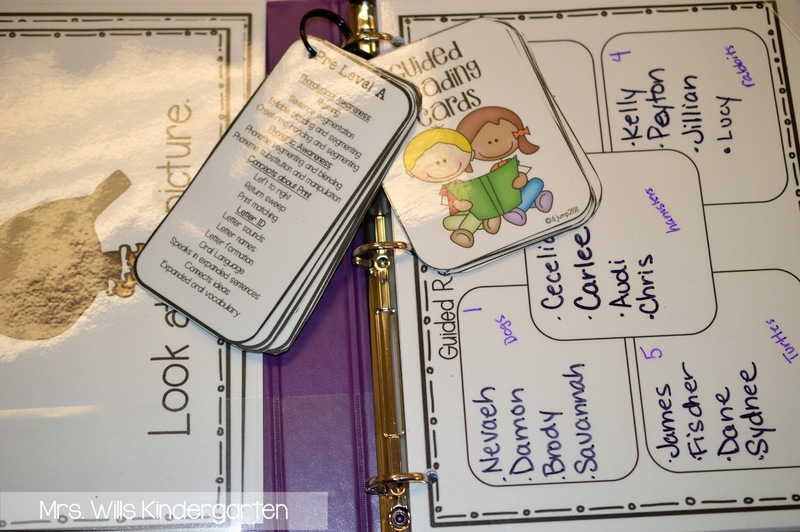 You can also find great leveled readers in this unit! 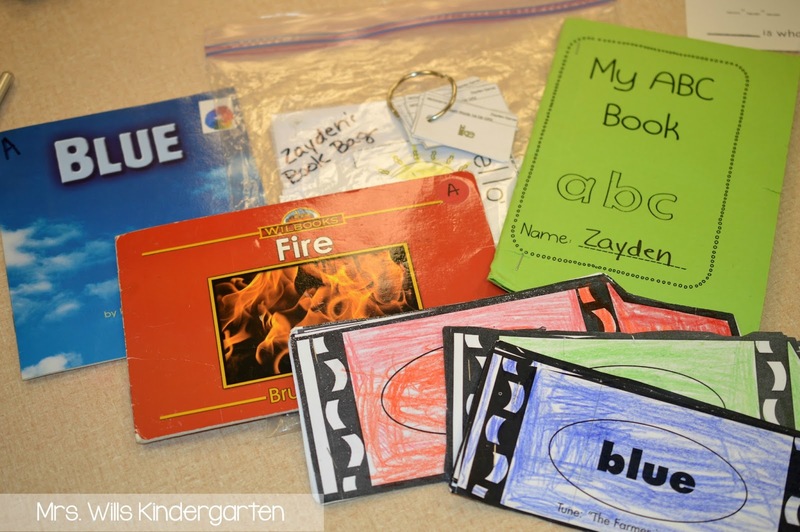 These are the resources we will use in these bad boys during reading groups. Sidenote: We also have our poetry notebooks and math journals, but they are kept in my student's desks. I will keep their learning journals with me. We will also be using a lot of word sorts. 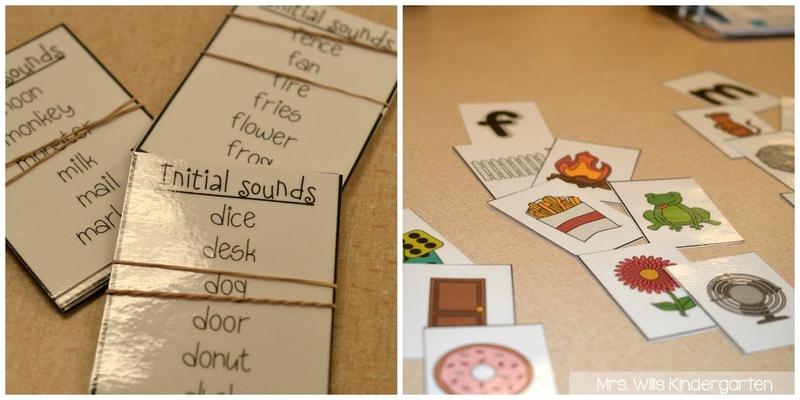 You can find my phonemic sorting resources here. and a ton of path of motion activities and practice. This Path of Motion practice is part of Abby's RTI unit. I think I use EVERY page of it! 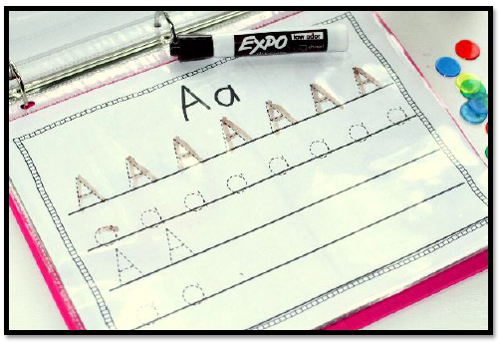 My friend, Cara, wrote an amazingly detailed post about how she runs her Alphabetic Small Group Instruction... it is a gem! I am not ashamed to admit that I read it 10 a few times. I hope this answers some of your questions about my small group time! You want more? 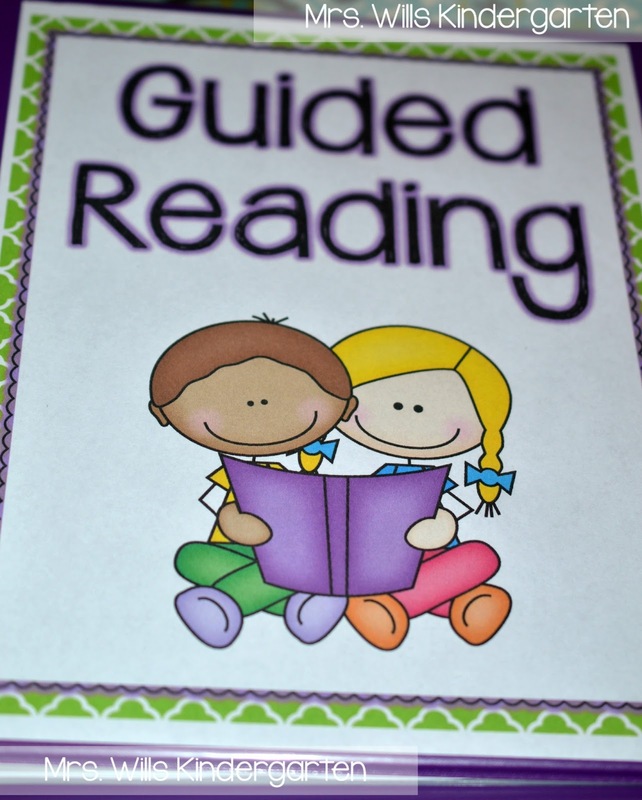 More ideas for reading instruction? Check out these wonderful posts!